Prior versions of the Kindle e-reader included audio capabilities which allowed you to listen to a book on your device or use Text-to-Speech to have a book read to you. The Kindle Paperwhite does not include these features, but don’t despair — you can still listen to a book and have it sync with the Kindle edition on your Kindle Paperwhite by using Whispersync for Voice. A Kindle Paperwhite: Make sure that Whispersync is turned on at your Amazon account. Go to the Manage Your Kindle page and select Manage Your Devices. Device Synchronization is near the bottom of the page. 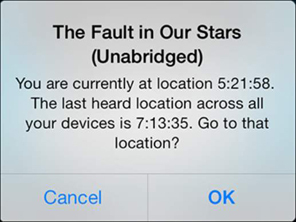 A device that plays audio files and supports the Audible application: The Audible application is designed to play books purchased from Audible.com or Audible books purchased from Amazon. The Kindle Edition of a book and the Audible audiobook version: You need to search on Amazon to find Kindle books with Audible counterparts. If a book supports Whispersync for Voice, that fact will be noted on the product page, as shown in the following figure. Amazon offers special promotions on Kindle Edition/Audible book combos. When you buy a Kindle book, check to see whether the Audible book is available at a discounted price. Now all you need to do is begin reading (or listening). When you switch devices, the synchronization should be automatic. 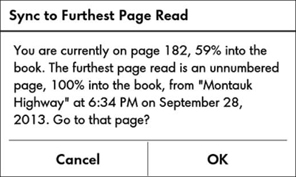 See the immediate figure below for an illustration of the sync screen on your Kindle Paperwhite and the following figure after for the screen on the audio device, in this case, an iPhone. If the sync does not happen automatically, tap Menu→Sync to Furthest Page Read. Synchronization screen on a Kindle Paperwhite. Synchronization screen on an audio device. You do not need to purchase the two books at the same time to have them synchronize between the Kindle edition and audiobook. Books bought at different times will still sync. At the time of this writing, the synchronization feature was available only between Amazon Kindle Editions and audiobooks purchased from Audible.com, which is an Amazon company.